Just got off the phone with an awesome/very helpful rep (1866 737 4159) basically my bundle is now about $8 cheaper at 76.82 taxes in for Ignite 500U 24.99 + Popular TV/PVR for 42.99. This is after I did Rogers Chat who offered 99.42 taxes in. He was also able to give me another year extension on all the (complicated) promos for my parents in law's place (ignite 500U for 24.99, starter TV and canto bundle 50% off) for about $74+tx. I accepted my offer Thursday evening and haven't seen any changes yet. I only recieved an email with an order confirmation saying I'll be contacted by someone within 24 hours if they had questions, or I'd get another email once completed. No updates yet..
No luck on my end, quoted me 67 for gigabit. What did you tell them and were you coming up for renewal? Interesting... i had $35 1 gpbs, and i saw same thing a few days ago. My new offer was $40 a month (45$ after tax). I had to call in to get the promo and renew for a year because it wasnt working online. Also i have bell ftth, their 1gbps offer was for $60 month, $100 visa GC, $60 activation. Once rogers 1 gbps get too expensive, ill be switching to bell, however even though i dont get the full 1 gbps on rogers, the savings of $30/ month is not worth the change to bell. our household hasnt had any major issues with speeds. We pull through 1.5TB per month in usage. Last edited by Jedi-- on Feb 10th, 2019 8:48 pm, edited 1 time in total. just signed up for $29.99 gigabit.. but speed seems to plateau @ 500mbps... anyone else experiences this? I'm on the $38/500u plan for 2 years, ending in Jan 2020. No pop-ups for me, besides the one that prompts you to choose which account . Same here. Tried the chat, they're offering Gigabit for $40 + tax but nothing better for 500u. I tried chatting as well no dice. But rep said a lot of people are messaging saying they saw on redflagdeals the promotion..... People don't say that just say your friends got the offer. You ruin it for everyone like that. In the end got gigabit for 50$ locked price for another year. Got the same offer too. But I forgot when my contract expires, anyone knows how to check? If I renew now, will the new one expire on Feb 10th, 2020? Or my contract date next year? 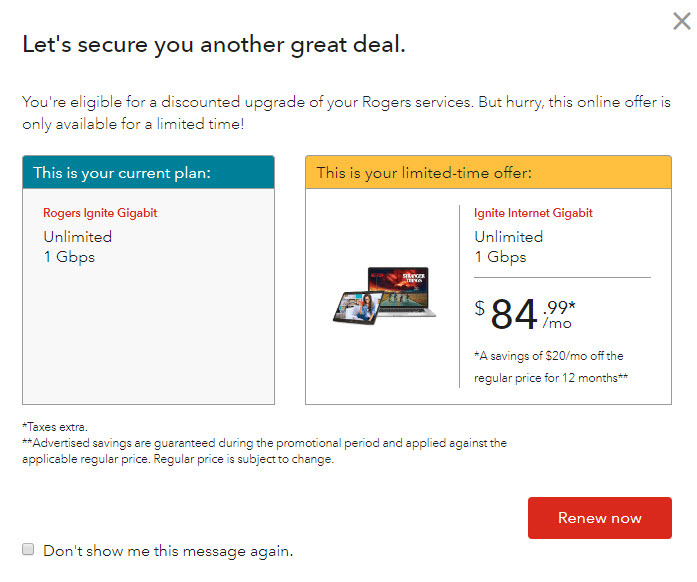 Lol I got this as my offer, **** rogers. Anyone in KW get this? I talked to 3 CSR and each one offered a different offer, and each saying that's the best they can do. All offers more expensive then my current plan. What kind of system do they have ffs. It's like they pull these numbers out of their arse. Thanks OP. Was on 500u for 29.99 in Ottawa, about to expire. Clicked the buttons... Gigabit for 34.99 for a year is worth not having to spend hours on the phone with retentions. I guess they got tired of guys like us calling every year to cancel and get a deal. Saved me a phone call and saved them a call as well. Thanks for who started this thread. I usually don’t log into Rogers account but this prompted me to do it. Rogers, if you’re reading this... do it again next year. Setting up reminder in my phone. Got the $35 1GB offer, in Carleton Place (just outside Ottawa) Had the $30 plan before and it was expiring at the beginning of end of march. For the simple fact of not having to haggle with them, this is completely worth it.